Authorities are going from town to town taking down Christian icons and replacing them with pictures of Chairman Mao and President Xi. Nowhere in China, it seems, is safe from the Chinese Communist Party, or CCP, and its ongoing endeavor to rid every home of any sign of belief. No matter who you are, or whatever your age, the Party is coming for your religious symbols. 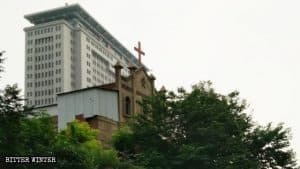 Fei Zhongju (pseudonym), an 80-year-old man from Xiayi county, under the jurisdiction of Shangqiu prefecture-level city, in central China’s Henan Province, learned that the hard way, after government officials barged into his home in October 2018 and ordered him to take down a picture of a cross and demanded he replace them with images of Chairman Mao and Xi Jinping. 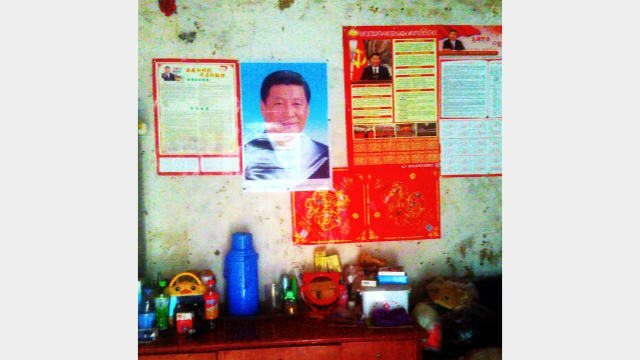 Portrait of Xi Jinping hung up in a Christian’s house in Shangqiu city. “If we come back for inspection and find that you haven’t put up Chairman Mao’s portrait, we’ll cancel your poverty alleviation benefits,” the officials said. Left with little choice, Fei did as required, climbing atop a table to hang the portraits. While he was in the process of doing so, he fell from the table and seriously injured himself. Not that the government officials cared, they’ve refused to take responsibility for Fei’s injuries; he’s unable to move well and can only lie in bed. 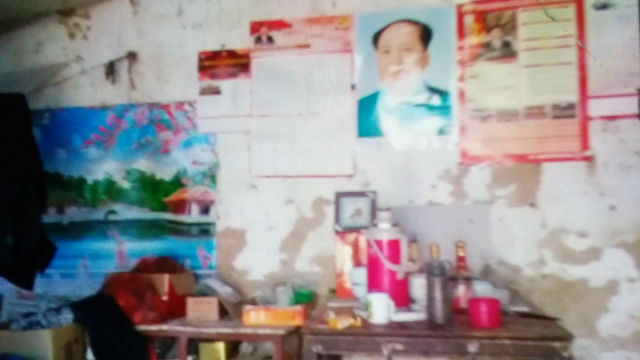 Portrait of Mao Zedong hung in the place of the picture of a cross in a Christian’s house in Shangqiu city. The looting of religious symbols in private homes has been going on since early 2018 – at least that’s when the elimination campaign commenced in Xiayi county. 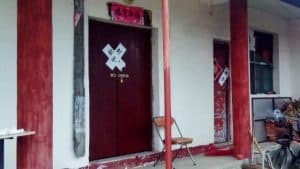 On September 20, when the Xiayi county Party committee secretary was investigating the religious beliefs of the populace, he discovered that some villagers had pictures of crosses hanging up in their houses, which didn’t go over very well. He immediately demanded that every township eliminate all religious symbols and items. 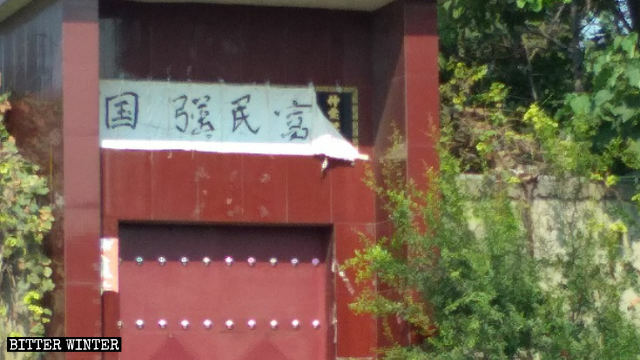 Chinese characters with religious meaning covered by the characters for “the nation is strong, the people prosperous” at the gate of a household in Xin’an county. According to Mr. Zhang, a government-employed worker from a village under the jurisdiction of Shangqiu, in early September 2018, while he was working out of town, he was called back for a new assignment. 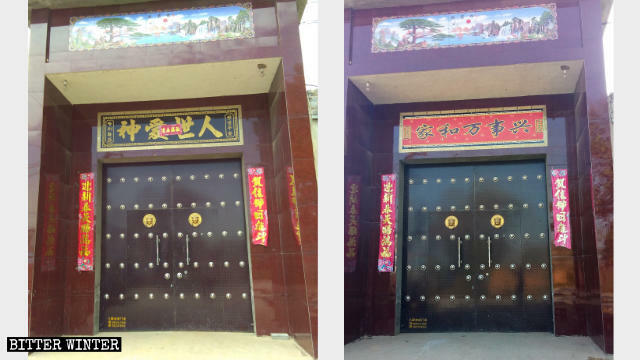 A village official handed him a list of households that had religious symbols on the gates of their houses and told him to go from home to home removing these symbols; he was offered 300 RMB (approximately $44) per gate that he removed religious symbols from. Chinese characters for “God loved the world” replaced with the characters for “Family harmony leads to thousand-fold prosperity” at the gate of one household in Xin’an county. 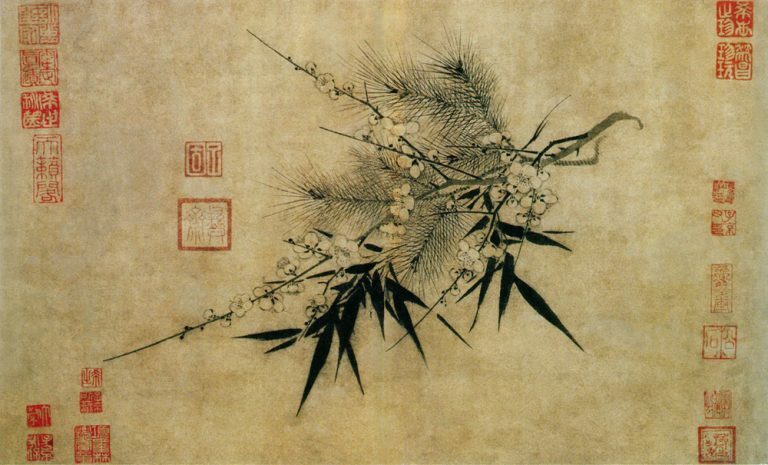 The government’s alleged reason for the destruction of religious symbols was the desire to have “a civilized and beautiful countryside.” In rural areas of China, most private homes have a courtyard with a wall that runs around the perimeter, serving as a sort of border wall, with a gate that serves as an entrance and an exit. This is where most Chinese homeowners hang their religious decorations or couplet banners and where they choose to engrave faith-related Chinese characters. 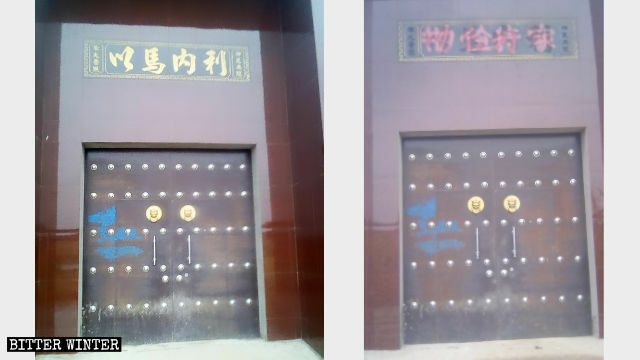 Chinese characters for “Christian Church” painted over at the gate of one household in Xin’an county. Though the exact figures are hard to come by, according to the information received by Bitter Winter, roughly 1,400 Christian items have been reportedly destroyed in households all across the townships of Xiayi county since early February 2018. 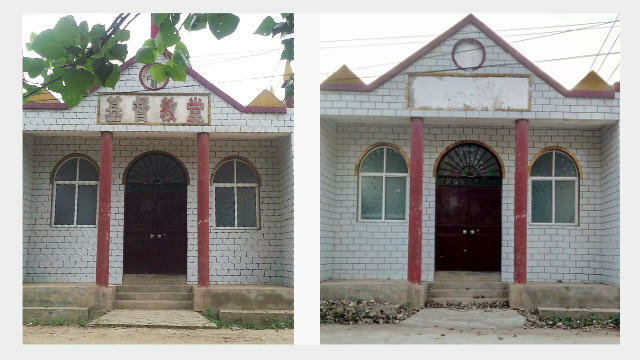 In October alone, 223 households in the Suiyang district of Shangqiu city saw the religious symbols on their gates removed and destroyed; and approximately 130 households across villages in the Liangyuan district endured the same. 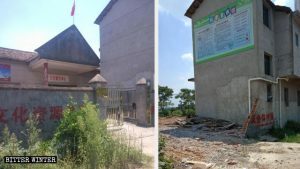 Within 15 days, the homes of 279 residents in Xin’an county, under the jurisdiction of the prefecture-level city of Luoyang, had their religious symbols removed. Eventually, every home in Xin’an was without religious banners or gate decorations. The story is similar in other Henan locations. In Puyang city, where local officials have frequently harassed and threatened villager Mr. Sun, who, despite orders to remove the religious couplet banners he had adorning the gates leading into his home, has refused to comply at all, on any demand. So, on August 31, officials took the matter into their own hands, destroying the banners themselves and painting over the gate’s engravings while Mr. Sun slept. Chinese characters for “Emanuel” replaced with “Hard work and thrift keep a household running” at the gate of one household in Xin’an county. “Anyone who hangs up portraits of Jesus or pictures of crosses has to tear them down and replace them with portraits of Chairman Mao and Xi Jinping. This is the policy of the Central Committee,” one government official said. And if citizens don’t take them down themselves, government officials will. 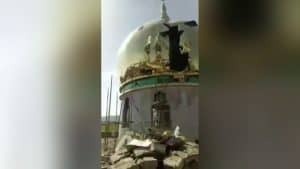 As villagers from Xiayi county said, officials in groups of three and four have been going from house to house conducting inspections and removing any religious paraphernalia found. 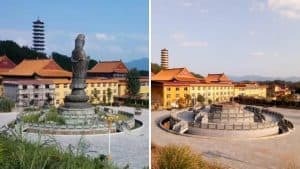 Villagers have likened the inspections to the Red Guards – a paramilitary students’ movement that was employed by Mao Zedong to destroy all pre-Cultural Revolution symbols in China. “Why is Xi Jinping eradicating everything related to religious beliefs? Is he the reincarnation of Mao Zedong?” a villager asked.